BC Parks is monitoring falcon activity to determine if and where falcons are nesting. Climbing route closures around the nest site will be posted on this website and at trailheads once the nest location is identified. If you encounter a falcon please respect them and keep your distance. Vehicles parked illegally at Stawamus Chief including the Apron parking lot will be subject to towing at the owner’s expense. Visitors must park in designated parking lots and observe the “no parking” signs posted. Vehicles parked illegally in closed day-use areas will be charged a fee for gate unlocking. Thank you for your compliance. Rockfall debris is present on the upper sections of the Angel’s Crest Trail. Please use extra caution in this area. Stawamus Chief Provincial Park protects the 700 metre massive granite cliffs that stand at the southern entrance to Squamish on the scenic Sea to Sky Highway. The park provides rock climbing opportunities of international significance. 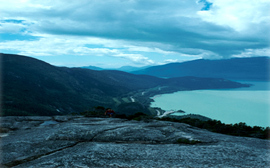 Hiking trails to The Chief’s three summits offer rewarding views of Howe Sound, Squamish town site and surrounding mountains. This park has opportunities for camping, hiking, rock climbing and scenic viewing atop the Chief. The Stawamus Chief is one of the largest granite monoliths in the world and provides good nesting habitat for the Peregrine Falcon. Please respect the wildlife and keep your distance. Viewing is best with a pair of binoculars. Please obey posted closures of climbing routes on the Chief during the critical nesting season of the Peregrine Falcon. The Chief Trail is a steep and difficult climb, requiring hikers to be in good physical condition. Hikers should be prepared with sturdy footwear, clothing, food and water. Obey posted closures of climbing routes on the Chief during the critical nesting season of the peregrine falcon. BC Parks and a volunteer group of climbers have developed the below strategy to manage rock climbing in Stawamus Chief, Shannon Falls and Murrin Provincial Parks. The strategy will be used to direct management activities related to rock climbing in the three parks. It must be stressed that this strategy is site specific and will not be applicable to the situations found in many other provincial parks. Best Practices Guide for Rock Climbing Route Development in the Squamish Area Provincial Parks [PDF 2.2MB]. This Best Practices Guide recommends new guidelines and considerations for rock climbing route cleaning, including route development, and intends to balance climber’s needs with protecting the environment and public safety. BC Parks has implemented a parking enforcement policy at Stawamus Chief and Murrin Parks. Provincial parks along the Sea-to-Sky corridor have experienced exceptional growth in visitor numbers, leading to parking congestion and illegally parked vehicles. Public safety is paramount for BC Parks, and new parking policies are in place to ensure safe access for all. Visitors must park in designated parking lots and observe the “no parking” signs posted. BC Parks has implemented a tow-away policy for any vehicles parked illegally. Please be aware, camping is allowed on designated sites only and all equipment, tents, etc., must be on the designated site. Located immediately adjacent to Shannon Falls Provincial Park at Squamish, BC. Squamish and Brackendale are the communities nearest to this park. Cultural Heritage: Named after the First Nation village of St-a-wamus at the north end of the Squamish River. Wildlife: Obey posted closures of climbing routes on the Chief during the critical nesting season of the peregrine falcon. This is a world class climbing destination. Climbing closures are in effect generally from March 15 until July 31 to minimize disturbance to nesting Peregrine Falcons. However, area closures may change year to year depending on where these magnificent falcons choose to raise their families. Commercial climbing such as guiding and giving instruction is prohibited unless authorized by a valid Park Use Permit. Bouldering opportunities exist at the base of the Stawamus Chief. Hiking trails are accessed from the day-use parking near the campground. They follow Oleson Creek before dividing into separate trails to each peak. The trails are also accessible from Shannon Falls Provincial Park. Be properly prepared for a strenuous hike and changing weather. Pets/domestic animals must be on a leash at all times except on the Chief Peaks trail. You are responsible for their behaviour and must dispose of their excrement. Backcountry areas are not suitable for dogs or other pets due to wildlife issues and the potential for problems with bears. Cold water taps are located at the entrance to the campground. There are no water taps at the highway pull-out day-use area. Taps are shut off during the off-season. This park has a day-use/picnic area. There are pit toilets and one (1) covered shelter available. There are no barbeque attachments on the picnic tables. The gate is locked from 11pm to 7am. The day-use area located within the highway pull out is provided with picnic tables, information kiosk and pit toilets. This area provides an excellent vantage for watching climbers and viewing the Peregrine Falcons. There is another day-use area located adjacent the campground which hosts picnic tables and offers a spectacular for of Squamish and Howe Sound. This park has pit toilets located in both the day-use and campground areas. There are no flush toilets. This park offers 16 vehicle accessible campsites on a first-come, first-served basis – campsite reservations are not accepted. Vehicle sites are not suitable for large RVs. Sites are very shaded with mature second-growth coniferous trees. There is parking for extra vehicles in the day-use parking lot, available for a fee. The gate is locked between the hours of 11pm and 7 am, and during the winter season. Walk-in camping is available when the gate is locked. If there are no staff available to direct you to a site, find a site that is not occupied by equipment or a valid camping permit. Campground fees are to be paid in cash at the entrance of the campground through a self registration envelope system. The closest store is in Squamish approximately a 5 minute drive north on Highway 99. There is a pay phone located next to the information kiosk. There are storage lockers located next to the cooking shelter. No campfires are permitted. Campsites are small and overcrowding is not permitted. Walk-in campsites are provided. The 58 sites are less than a 5 minute walk from the parking lot. The tent pads are raised gravel pads with a wooden border. Tent pads are small and overcrowding is not permitted. Sprawling of gear and camping equipment off of tent pad is prohibited thus ensuring understory vegetation is not damaged. A central cooking shelter is available. Park visitors must bring their own cook stove; campfires are prohibited. Campsites are extremely shaded with large mature coniferous trees. Please store all food in the storage lockers located throughout the campground and in the cooking shelter. This park has winter camping opportunities; however, the gates are locked in the winter, so camping is walk-in only and no services are provided.